When the Amoras series was expanding once again, we couldn’t be happier, even though this spin-off of the spin-off revolves around the antagonist Krimson, before the events of Amoras occurred. Nonetheless, we were able to see how the criminal mastermind was formed, or at least the tip of the iceberg, as Krimson was once a kind doctor, who once crossed paths with none other than Lambik. While the previous issue only unveiled a bit of the mystery, this second issue shows us more snippets of Lambik’s past, when he came across the ‘good’ doctor. It’s quite hard to explain all that is going on without spoiling the entire issue. All we can say is that Lambik is still enraged because Barabas looked inside his mind to extract some of his memories of when Lambik met Krimson, when he was still a normal doctor. Lambik is still roaming around aimlessly, thinking of how he can get back at the professor and the rest for messing with his brain. In the meantime Barabas is looking at the memories in order to find a clue. All this happens while Suske and Wiske found Krimson’s briefcase and want to uncover what is inside. Sadly for them, it seems that other people are also after the briefcase, and thus they will have a hard time relaxing and finding a way to open it. While this issue has a lot more action than the first of the chronicle albums, it still is all about uncovering what made Krimson the villain he is today. It’s clear that Marc Legendre wants to keep us in the dark for a bit longer, as we have to work with a minimum of information, while a few interesting events from Lambik’s past are unveiled, with Krimson only playing a minor part. The ending is rather surprising, as it shines a light on another character, who wasn’t supposed to be in Lambik’s past, but for some reason is. Illustration-wise not much has changed. The usage of the flashbacks is a bit more frequent compared to the last issue, and the bland coloring and somewhat brownish tinting creates a fun vibe to illustrate said sequences of the past. Overall things are in sync with the other Amoras albums, which means you’ll be treated to a fairly grim deteriorating world. 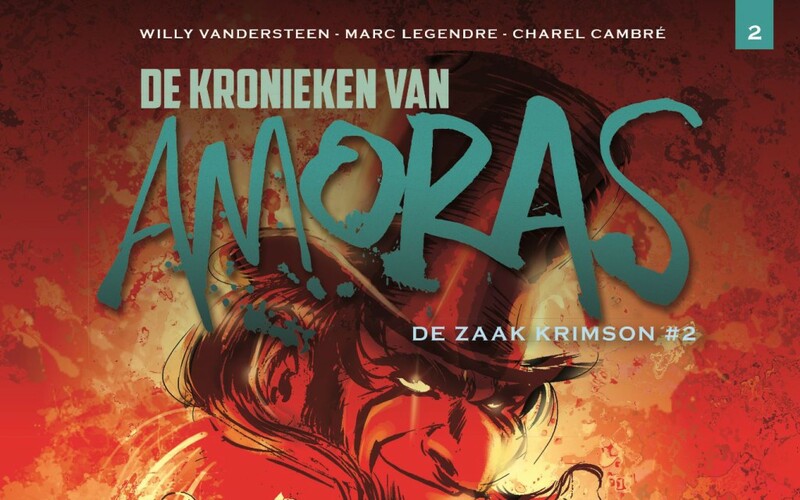 De Kronieken van Amoras: De Zaak Krimson #2 is a great continuation of the newly found ‘series’, but it still doesn’t give us that much information on how the notorious criminal came to be. This issue actually raises even more questions, but even though the veil isn’t lifted yet, we are intrigued by this album, as it constantly pulls you closer to the truth, while keeping you at a certain safe distance as well. Overall the harmony of pulling a reader in the story, while keeping you on edge with a minimum of information works perfectly.